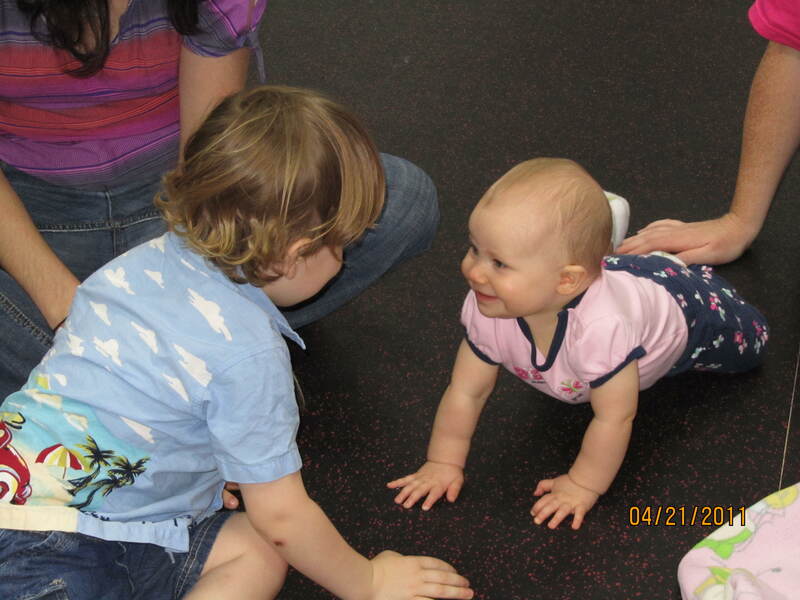 Kindermusik is a mommy and me class that guides your child into learning through music and movement. We sing, we dance, we create, and make new friends. Each class has a specific routine from the hello song, to instruments, dancing, stories, rocking time, and a goodbye song. Your child will love learning each part of the class and feeling more comfortable each week. This routine gently guides them into the learning process. In Kindermusik, we guide you and your child through the activities intentionally, so that your child’s brain tunes in to the learning all around. Your child will show you what they are learning as you go throughout your week and his or her brain continues thinking about it. For example, one mom told me that her daughter didn’t sing the song in class, but she did later that week in the car! Plus, they will want to hear the story every night before bed! 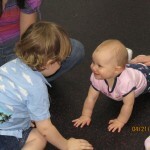 Intentionally building a process of learning in your child through music and movement is what Kindermusik is all about. Research proves this process works, because music and movement connect your child’s brain to learning. For example, when your child hears you say the word “march” while marching, the brain connects the word and the action. Each week in class and every day at home we practice and solidify these connections. These strong neural connections will be ready to learn any thing in school. Another example involves mathematical readiness: When we play egg shakers, we shake them up high, down low, behind, in front, and with each hand across the body. While we are having so much fun, the brain starts to recognize the space around the body, the shapes in the world, and distances from one person to another. The brain is learning spacial recognition and that skill will be helpful in walking in line, drawing, playing sports, and in geometry class! The best part is, your child is going to have such an amazing time in our toddler, baby, or preschool music classes, that she or he won’t even know he or she is learning!!! All they know is that they are having fun singing, dancing, and playing instruments with mom or dad or grandma! They love the stories, they love the games, and the music! You will often hear them say: “read this story, Mom” and it will be a story from Kindermusik class. Why? Because they remember the story and how much fun they had with it and their friends at Kindermusik. Bringing the learning experience home and enjoying music with your child, that’s the value of Kindermusik! It’s not just a once a week class, but it is a every day experience at home, especially with our new digital home materials. Digital home materials include: 25-30 songs each month (a $30 value), a new story each month, downloadable and printable activity pages, parent information about the benefits of Kindermusik, videos, games, and more! Music is an important tool for your child to learn the basics of learning, thinking, creating, and being. Through music your child can tune into new words, new sounds, new phrases, and learn to love reading. Music is also a great tool for helping the brain to understand mathematical concepts. Kindermusik is the curriculum and intentional process of learning that helps your child tune in and be ready for school and for life!